A group of young artists have adorned a number of sites in Shanghai with 3D murals painted on walls and the floors, making the metropolis more distinctive and approachable. 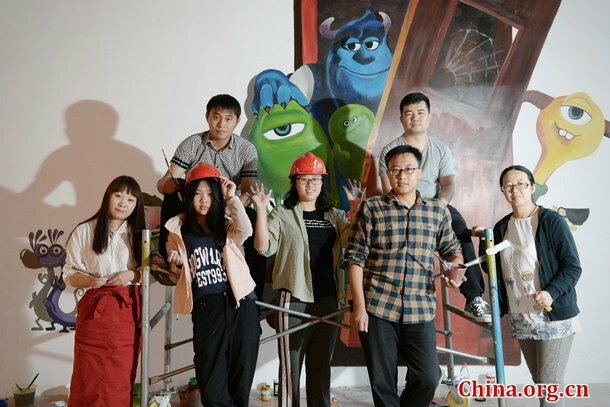 The eight young muralists, who graduated from different art schools and colleges across the country and share similar tastes and interests, found each other in Shanghai and now work together. 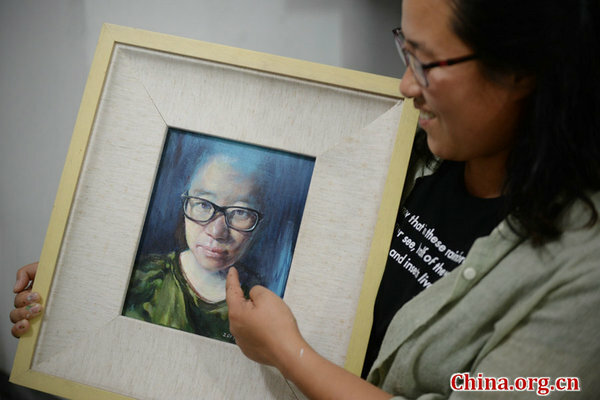 Yue Yawei, an art college graduate from Ningxia Hui autonomous region, came to Shanghai 10 years ago to establish a career. He cycled through several jobs before becoming the boss of his own 3D mural-painting business three years ago. Yue's idea to start a company came after he took a short-term contract painting 3D murals in a hotpot restaurant. He received a considerable sum for the job, which inspired him to tap the market potential of 3D mural painting. Yue later resigned from his job as a web designer and devoted himself wholly to the creation of 3D murals. In 2015, he launched his own company, which now employs a team of ten. 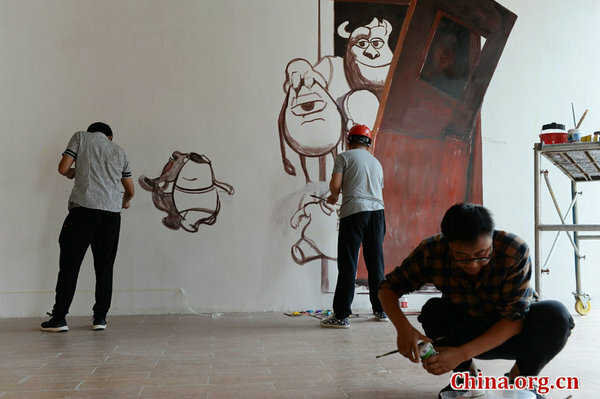 Feng Xiao, one of the muralists in Yue's company, graduated from the Sichuan Fine Arts Institute. "This job requires both talent and physical strength," said Feng, explaining that a 3D mural usually covers dozens of square meters and takes multiple artists many days to complete. A typical example is a 30 square-meter aerial view of Shanghai that took the team two weeks to complete last year. "Working outdoors, everybody has to wear a hardhat and climb up a 6-meter-high scaffold, no different from construction workers," said Guo Jinling, the company's art director. After graduating from the College of Fine Art at Ningxia University in northern China, Guo came to Shanghai seeking job opportunities. She says she has gone through thick and thin with her colleagues in the past three years, but that the company has an increasing number of customers, with orders now coming from both within Shanghai and other parts of the country. "Last year, we received more than 100 orders online, with a yearly turnover of more than 800,000 yuan (US4,500)," said Hua Jing, who is in charge of customer service for the company. To date, Yue Yawei and his team have completed thousands of 3D murals covering tens of thousands of square meters in total. 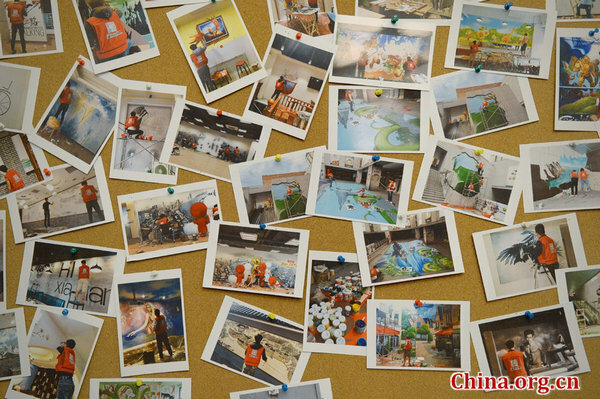 Yue likes to take videos and photographs of their mural-making scenes to record the progress of his company and employees. Speaking of the future, Yue is full of confidence. "We still cannot have a stable income like white-collar workers, but whenever we see the beautiful 3D murals painted in the urban streets and rural roads around us, we forget all the hardships and setbacks we have experienced, and we feel happy and satisfied," Yue said. Yue believes that e-commerce has given mural artists a broader future, which will hopefully bring the talent of his team of artists into full play, while also bringing greater profits to the company.